Pennsylvania is in a very tight race. Our internal polls are telling us Hillary is up by 1% in Pennsylvania, which many consider Hillary's firewall. Whether we win or lose will depend on turnout in Philadelphia and Pittsburgh. The rest of the state is ALL Trump. I am not in full panic mode - but I am extremely nervous. We need to be taking this very seriously. If Trump wins PA he has a realistic path to 270 electoral votes. If Hillary wins PA, Trump's path becomes almost impossible. Let me remind you - If Trump wins, not only will he get to appoint the next 3-4 Supreme Court Justices, but he will come into Republican majorities in the Senate and House. There will be NO checks and balances to slow down what will surely be an all out assault on unions, civil rights, voting rights. For us, this election is like Friedrich's on steroids. Along with HPAE, we have been asked by AFT National to help bring NJ volunteers into Philly to help with voter contact. Toward this goal, we have scheduled a bus trip on 10/15 to leave Rutgers Labor Ed Center at 8 am and return by 5:30. Please pass this info to your members and help us recruit volunteers to fill the bus - or they can drive directly if they live closer to Philadelphia (driving directions attached). Volunteers can register and reserve a seat on the AFTNJ website at www.aftnj.org. We really need everyone's help with this. Thank you! Today, members of the state Assembly passed S-2160/A-3819, a bill that will allow workers to access unemployment benefits after 30 days on strike or depending on the nature of the labor dispute. We thank our many affiliates and allies, who joined us in supporting this important legislation, and urge the governor to, for once, put the interests of working families first and sign this measure into law. CLICK HERE to see how your legislators voted. Far too often, workers are taken advantage of by unscrupulous companies that use their size and resources to force workers into accepting unreasonable wages and working conditions. This legislation would ensure workers are not starved back to work by their employer, that they have the means to stand up for fair treatment on the job, and can have a basic level of income to provide for their families during a prolonged labor dispute. Workers with UNITE HERE Local 54 were on strike for more than a month at the Taj Mahal after billionaire Carl Icahn stripped away health care and pension benefits from casino workers and took away their half-hour paid meal break. Rather than respecting the needs of workers, management announced its intent to close the property, forcing approximately 3,000 people out of work. It is clear that additional protection is needed for working people, fighting for fair treatment in the workplace. The New Jersey State AFL-CIO thanks the primary sponsors of this legislation, Assembly members Quijano, DeAngelo, Giblin, Benson, Zwicker, Danielson, and Houghtaling as well as Senate President Sweeney and Senator Joseph Vitale. When workers’ rights are undermined, employees shouldn’t have to sacrifice their livelihoods just to stand up for the justice they deserve. This legislation marks a strong step forward and the New Jersey State AFL-CIO will continue to lead in this effort. 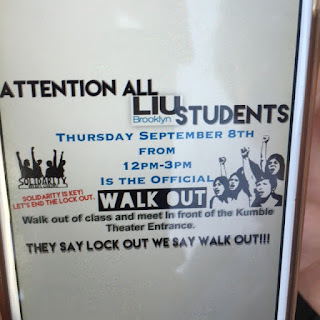 Hundreds of Long Island University students walked out of their classes at noon on Thursday to protest the administration's continued lockout of their professors, a move they say has compromised their education and the rights of students and teachers alike. Many said that classes—taught by an interim staff—were as disorganized this morning as they had been on Wednesday, the first day of the semester.